Welcome to the five hundred and forty-eighth of my blog interviews with novelists, poets, short story authors, biographers, agents, publishers and more. Today’s is with children’s author and speaker Cheryl Carpinello. A list of interviewees (blogged and scheduled) can be found here. If you like what you read, please do go and investigate further. Morgen: Hello, Cheryl. Please tell us something about yourself, where you’re based, and how you came to be a writer. Cheryl: I’m a retired teacher with a passion for working with kids. I regularly conduct Medieval Writing Workshops for local elementary / middle schools and for the Colorado Girl Scouts where we explore writing and reading, and it is fulfilling to see young students excited about writing and reading. The kids enjoy writing their own medieval stories complete with dragons, wizards, unicorns, and knights! I have been an avid reader for as long as I can remember. I used to find the books my parents would get me for Christmas and read a few pages before they wrapped them! Writing just seemed to follow. We love to travel, and so my other job is with a major airline. Our favorite city to visit is Las Vegas, Nevada. In the fall, we like to travel to college football games. My favorite trip was a two-week visit to Egypt that included traveling by local train from one end of Egypt to the other. Morgen: I helped out at a teenager writing group at my local library and as you say, it was great seeing them getting so fired up, especially as I came to it in my late thirties (now mid-forties). I used to think that I’d missed out on all those years but I have the experience to write about. 🙂 You write children’s books, and from what you say, it seems logical for you to choose this genre. What age group do you write for? 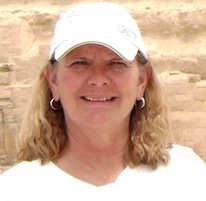 Cheryl: Teaching students in high school who didn’t like to read or who found a million other activities to do rather than read motivated me to dig deeper into my curriculum. It is always challenging to find reading material that excites every student. In fact, it is nearly impossible. Then one spring I decided to do The Once and Future King by T. H. White. My freshmen were ecstatic. We read; we discussed; we drew murals of chapters; we wrote poetry and songs; and we attempted to earn Knighthood in seven days! Boy, what a discovery I’d made. I continued to teach the King Arthur Legend, and the enthusiasm never waned. I had students who would give 100% on this unit when I struggled to get them to read other literature. These kids were my inspiration for choosing the legend of King Arthur for my writing. I use the appeal of King Arthur to encourage young kids to read more and to believe that they can write. I always come away from a school visit believing that I have helped the students relate better to their writing, and hopefully, ignited a little spark in the reluctant readers to pick up a book. I typically write shorter books for the readers I’m trying to reach. My focus is on reluctant readers in grades three through eight. These reluctant readers are kids who are able to read, but prefer to do other activities. If I can reach them early in their schooling, it’s just possible I might hook them into exploring other books. I’ve yet to find a student in the younger grades who isn’t excited about the medieval time period. Morgen: It sounds wonderful (especially as history was one of my worst subjects at school). Could you tell us about your writing process. Do you plot your stories, or do you just get an idea and run with it? Cheryl: I enjoy writing, but I’m not always writing. Coming from the teaching profession, I’ve learned to bide my time as far as my writing goes. For years during the school year, I barely had time for reading, let alone writing. Once I get an idea for a story, I write out an outline. It’s not overly detailed, just an overview of the entire story. Then I spend several days doing what I tell my students is brainwork. I just think about what I’ve outlined, the possible characters, the storyline, conflicts, etc. I then go back to the outline and fill in some of the missing pieces. I do more brainwork and then finalize the outline. Once that is done, I start writing. The hardest part of writing for me is getting that first draft done. I’ve learned to jot down notes to expand a scene, do a bit more of research, add more dialog, etc. as I work on that first draft. This way, I don’t stop my momentum. At this stage of my writing, my only goal is to get the story down from beginning to end. Perfecting the story comes through numerous revisions and lots of hard work. Once the story is done, I go back over my outline and see how the two fit or don’t fit together. Then it is editing and revision time. I generally go over a work three or four times, in addition to letting my editing partner have a go of it. Morgen: Who (if he / she is anything like mine) will probably come up with great suggestions. Have you had any surprises when you’ve been writing? Cheryl: Oh yes. I had finished The King’s Ransom and realized I had a major gap in my story as far as my readers were concerned. I literally had to go back to the beginning and change a character. This entailed creating a new description, new dialogue, new character thoughts and changing numerous scenes throughout the entire story and especially the ending. I can’t reveal that change without spoiling the story. That’s how important the addition was. Morgen: Wow, but worth it in the end, I’m sure. What are you working on at the moment / next? Cheryl: I started what will be my next book in May 2010. Over the two and half years, this story has taken many shapes. Each time I’ve ended up rejecting the format. I know the story I want to tell, but it wasn’t until this past August that I finally settled on the story format. This story will take my readers out of Medieval England and back to Ancient Egypt. It will be a mystery for tweens / YA and will introduce readers to a famous boy pharaoh. I’m also working on a sequel to Guinevere: On the Eve of Legend. I’ve had several readers ask me what becomes of Guinevere’s friend Cedwyn, so I’m working on a storyline there. And, sometime soon, I’m definitely going to do another Young Knights of the Round Table. Morgen: I’ve just self-published my debut novel and that was three years in the making (seven edits, two other pairs of eyes, my writing group’s ears and 117K down to 101K later), but I do feel (hope) it’s a better book for it. What advice would you give aspiring writers? Cheryl: I know it’s been said many times, but writers need to write what they love. Also, don’t be afraid to explore and expand on that. It was my love of King Arthur that propelled me into writing. Tying that together with Joseph Campbell and the hero’s journey inspired me in my writings for young people. Today this has taken me beyond Arthurian Legend to ancient Egypt where a young pharaoh embarks upon his own journey to write a wrong and be united with his one true love. Sometimes a person’s writing can take them places they never imagined. Rejoice in that and embrace it! Morgen: Absolutely, it’s my favourite aspect (not knowing what’s going to come out). What’s your approach to marketing, Cheryl? Cheryl: Having self-published Guinevere, I learned that marketing is a never-ending job. In fact, most of the time it can be overwhelming. Getting a book in front of as many people as possible is the key to successful marketing. I blog about my books on my blog site, Carpinello’s Writing Pages. I’m also a believer in gaining exposure and visibility by entering contests. Guinevere: On the Eve of Legend was a finalist in the 2011 Global eBook Awards and that has boosted my sales. Specifically for The King’s Ransom (Young Knights of the Round Table), I’ve done the same types of marketing. I’ve done blog interviews, and right now I’m halfway through my three-month blog tour that includes interviews, book reviews, blogs about the King Arthur Legend, and upcoming blogs about mythology and kids and parenting. I’ve also entered The King’s Ransom is several contests. In July 2012, the book was honored by the Children’s Literary Classics with their Seal of Approval, and in October 2012, The King’s Ransom received CLC’s Silver Award for YA Fiction. This is really a boon for me as one of my main target audiences in elementary school classrooms. School visits in connection with my medieval writing workshops have to be my favorite marketing tool. Additionally, for The King’s Ransom I tried something totally new. I wrote a 40-plus page promo ebook and published it on Amazon. The promo book includes my characters’ interview, an author interview, previously unpublished material from the original manuscript, an excerpt from The King’s Ransom and other goodies. 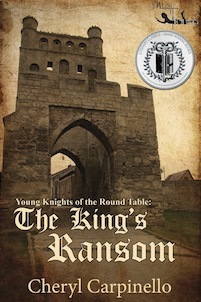 I enrolled Behind the Scenes of The King’s Ransom (Young Knights of the Round Table) in Amazon’s KDP Select program and will again be offering it for free in the near future. Morgen: Congratulations on your success, you’ve clearly worked hard for it. And do let me know (with a bit of notice) when your book is going to be free and I’ll run a 5a.m. flash for it (the details of what I’d need are on that page). And finally, where can we find you and your books? My main website Beyond Today (Educator) contains information on both Guinevere and The King’s Ransom. The events section is a picture gallery of the Medieval writing workshops I do with the Colorado Girl Scouts. On my blog Carpinellos Writing Pages, I review Children / MG / Tween / YA books, conduct interviews with authors, and post ideas to get kids involved in reading and writing. Visitors can still do the virtual blog tour of the book’s settings in Wales that I posted when The King’s Ransom released. Morgen: A very busy lady (I’ve added you to my reviews-childrens page). Thank you very much, Cheryl. You’re so welcome, Cheryl. Glad you could join me, and do let me know if you’d like to do anything else anytime.